OK, we’ve received a myriad of questions about how, once the hull is ready, we go from 4’ x 8’ sheets of Aquatek Marine Plywood to the inner skin of our True 5200 bottoms. John shares his “tricks of the trade” in this clip. Once John has fabricated all of the pattern pieces for one face of the bottom, tension builds. If we have done our work well and the hull is true stem to stern and port to starboard, once flipped to the other face, the panels will fit perfectly. Today they fit within 1/16 – 1/8 inch, which is excellent, given that we began with a corkscrewed, hogged hull. Phew! Once we have fabricated all of the component pieces, which we dry screw in place so we can ensure an absolutely perfect fit, we release them and begin prepping them for installation. 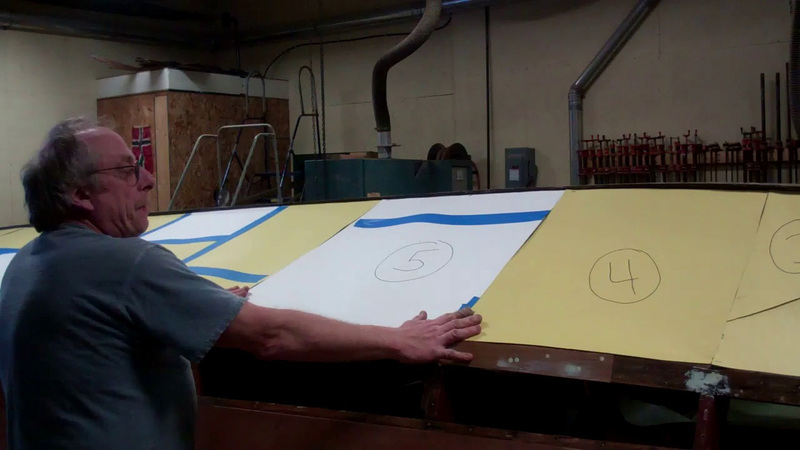 Each sheet will receive 3 heavy coats of Clear Penetrating Epoxy Sealer (CPES). [Yes, as Danenberg prescribes, the second coat is applied immediately following the first coat. We then wait 24-48 hours to apply the third coat and give it 48 hours to cure. Once they are sealed, the inner surfaces will receive a heavy coat of Sandusky Paint Company Chris-Craft Red Bilge Paint, and we will begin installing the skin, piece by piece, heavily bedded in 3M5200. Before the plywood begins going down, however, we will ensure that all mating frame surfaces have received one light coat of the same bilge pain – again following Danenberg, By this time next week, plywood should have replaced construction paper.